In the United Arab Emirates, foreign nationals constitute over 80 percent of the population. Brought in to construct the towering monuments to wealth that punctuate the skylines of Abu Dhabi and Dubai, this labor force works without the rights of citizenship, endures miserable living conditions, and is ultimately forced to leave the country. Until now, the humanitarian crisis of the so-called “guest workers” of the Gulf has barely been addressed in fiction. 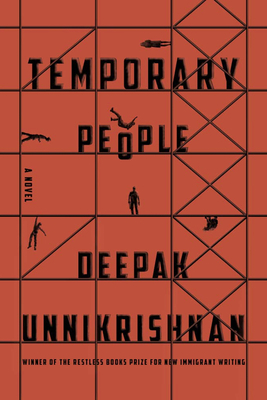 With his stunning, mind-altering debut novel Temporary People, Deepak Unnikrishnan delves into their histories, myths, struggles, and triumphs. Combining the irrepressible linguistic invention of Salman Rushdie and the satirical vision of George Saunders, Unnikrishnan presents twenty-eight linked stories that careen from construction workers who shapeshift into luggage and escape a labor camp, to a woman who stitches back together the bodies of those who’ve fallen from buildings in progress, to a man who grows ideal workers designed to live twelve years and then perish—until they don’t, and found a rebel community in the desert. With this polyphony, Unnikrishnan brilliantly maps a new, unruly global English. Giving substance and identity to the anonymous workers of the Gulf, he highlights the disturbing ways in which “progress” on a global scale is bound up with dehumanization. Deepak Unnikrishnan is a writer from Abu Dhabi and a resident of the States, who has lived in Teaneck, New Jersey, Brooklyn, New York and Chicago, Illinois. He has studied and taught at the Art Institute of Chicago and presently teaches at New York University Abu Dhabi. Temporary People, his first book, was the inaugural winner of the Restless Books Prize for New Immigrant Writing. "Inventive, vigorously empathetic, and brimming with a sparkling, mordant humor, Deepak Unnikrishnan has written a book of Ovidian metamorphoses for our precarious time. These absurdist fables, fluent in the language of exile, immigration, and bureaucracy, will remind you of the raw pleasure of storytelling and the unsettling nearness of the future." "Guest workers of the United Arab Emirates embody multiple worlds and identities and long for home in a fantastical debut work of fiction, winner of the inaugural Restless Books Prize for New Immigrant Writing . . . The author's crisp, imaginative prose packs a punch, and his whimsical depiction of characters who oscillate between two lands on either side of the Arabian Sea unspools the kind of immigrant narratives that are rarely told. An enchanting, unparalleled anthem of displacement and repatriation." "Inaugural winner of the Restless Books Prize for New Immigrant Writing, this debut novel employs its own brand of magical realism to propel readers into an understanding and appreciation of foreign workers in the Arab Gulf States (and beyond). Through a series of almost 30 loosely linked sections, grouped into three parts, we are thrust into a narrative alternatinting between visceral realism and fantastic satire . . . The alternation between satirical fantasy, depicting such things as intelligent cockroaches and evil elevators, and poignant realism, with regards to necessarily illicit sexuality, forms a contrast that gives rise to a broad critique of the plight of those known euphemistically as "guest workers." VERDICT: This first novel challenges readers with a singular inventiveness expressed through a lyrical use of language and a laserlike focus that is at once charming and terrifying. Highly recommended." "Deepak Unnikrishnan uses linguistic pyrotechnics to tell the story of forced transience in the Arabian Peninsula, where citizenship can never be earned no matter the commitment of blood, sweat, years of life, or brains. The accoutrements of migration—languages, body parts, passports, losses, wounds, communities of strangers—are packed and carried along with ordinary luggage, blurring the real and the unreal with exquisite skill. Unnikrishnan sets before us a feast of absurdity that captures the cruel realities around the borders we cross either by choice or by force. In doing so he has found what most writers miss: the sweet spot between simmering rage at a set of circumstances, and the circumstances themselves."